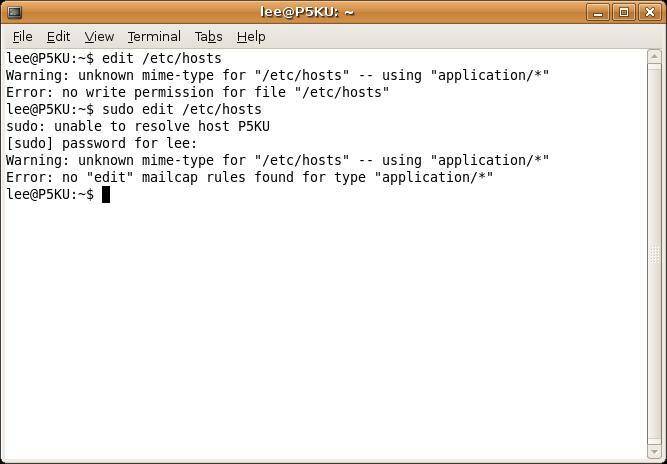 When sudo can not resolve the hostname there is a race condition that prevents gksu from detecting the password prompt. Before installing this update, any command called with gksu/gksudo would just hang without error message if /etc/hosts did not include my local machine name. I've originally worked around the original bug (#55172) by modifying the first line of /etc/hosts so that i reads "127.0.0.1 localhost johndoe-desktop", where johndoe-desktop is my machine name. Restoring the line to its original state brought the bug back, as expected. After installing the proposed update, gksudo/gksu no longer hangs if my machine name is not included in /etc/hosts, so i would say that it works as intended. Instead of using "gksu id", i used "gksu gedit" for testing. P.S. There is something strange that i notice if i completely comment out my 127.0.0.1 line in /etc/hosts. Running gksu gedit still works and the gdit window appears as it should. Sometimes, this message is repeated several times. This does not occur if the line is not commented out. Intrepid has a newer version, cannot copy hardy-proposed to intrepid. Michael, please fix this in intrepid ASAP. Hm, this should have been autoclosed on June 04 by my intrepid upload, not sure why it was not. As you can tell from the attachment, I can't remove the the line. Under the tuteledge of Thomas Kluyver, I executed the first 6 lines in "TEST CASE," above. It did not hang. I did not attempt to execute lines 7 through 9. @Leroy: Thanks for your test, I updated the text to explicitely mention that "gedit" instead of edit should be used. Despite the apparent success, the problems persists and there are more of them. For example, I can not remove any application, and , when composing an Email message using Evolution, I can type faster than the cursor moves -- I use two, maybe three, fingers. I suspect that the only solution is reinstall. However, I feel obliged to offer not to do this immediately so as not to waste your previous investments. But I am getting impatient. How about this? What are my obligations? I'm still trying. To review a little bit: 1) The download arrow on the tool bar does not work. When I click on it the rotating ball rotates indefinitely. 2) apt-get update, does not work, but sudo synaptic --upgrade-mode, does work. I used this before but only installed the current updates. this time I selected "ALL". this resulted in the following message in the terminal. @Leroy: The thing about composing e-mail in Evolution is, as far as I can see, completely unrelated--try looking at other bug reports or forum posts to see if anyone else has experienced that. Anything that would normally use gksudo--including the upgrade manager and synaptic being launched the normal way, will not work. You should still be able to run any of them (as a work-around) by using a command line and doing "sudo whatever", e.g. "sudo synaptic", "sudo update-manager". it has usually solved the problems.